If you’ve been following our InstaStories (which you FOR SURE should be), you know that progress at the new house has been painfully slow. 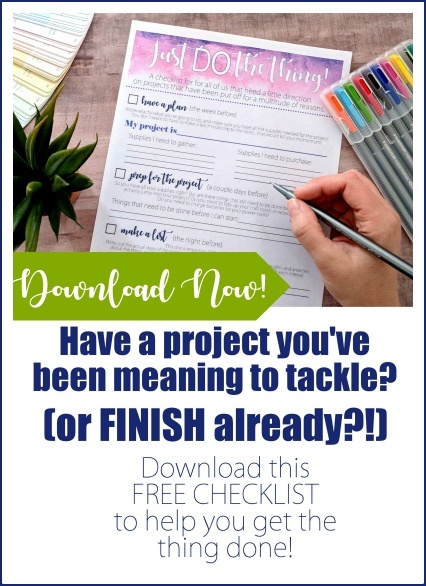 Since the ‘kitchen project’ has been delayed for so long due to rain and flaky contractors, Nick and I have been busying ourselves with things like wallpaper removal, painting, stenciling, and removing stair carpet… which, as it turns out, has some tricks that make it much easier. So that’s what we’re sharing today! Here’s a reminder of what our entryway looked like when we moved in! Obviously, it has it’s strengths. HAHA! What am I saying?! It’s amazing! 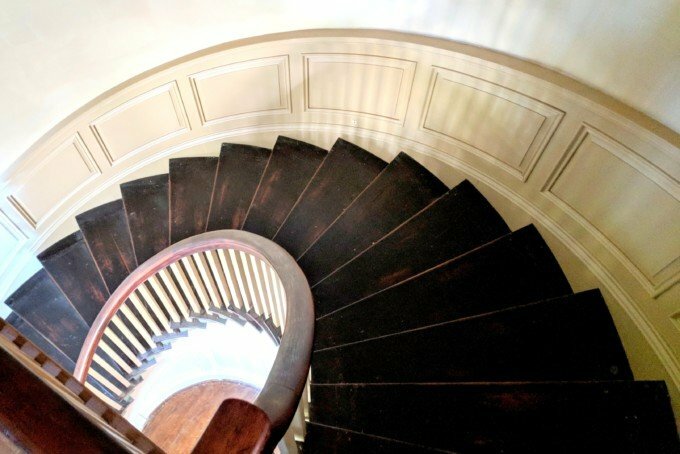 The view of this curvy staircase right after walking in the front door was enough for me to sign on the dotted line right then and there. And before even seeing the rest of the house! But the stairway needs work, much of which is structural since the railing is pretty wobbly. But the actual stairs are in good shape. The only problem with them is that they’re cloaked with old icky carpet! We started out by taking out all the carpeting that’s on the floor in the entryway. 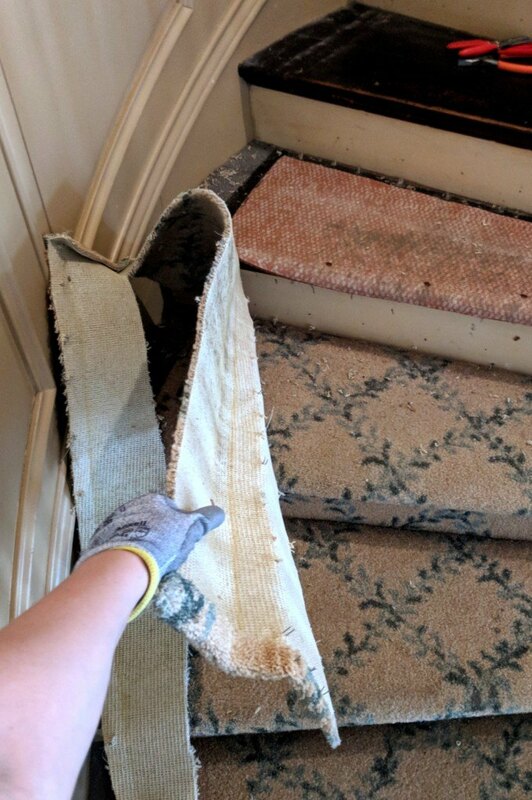 Luckily the carpet didn’t continue into any of the entryway’s connecting rooms, so it wasn’t a huge task. Shortly after taking the above pic, we realized that a trip to the home improvement store for some gloves were in order. 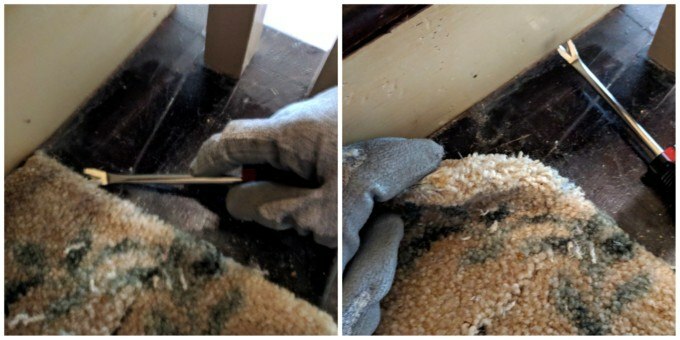 And since we’re talking about safety measures, we might as well chat about all the handy items that made the process of removing stair carpet remarkably simple! After tackling the carpet on a few stairs, we learned some things and got into a rhythm. 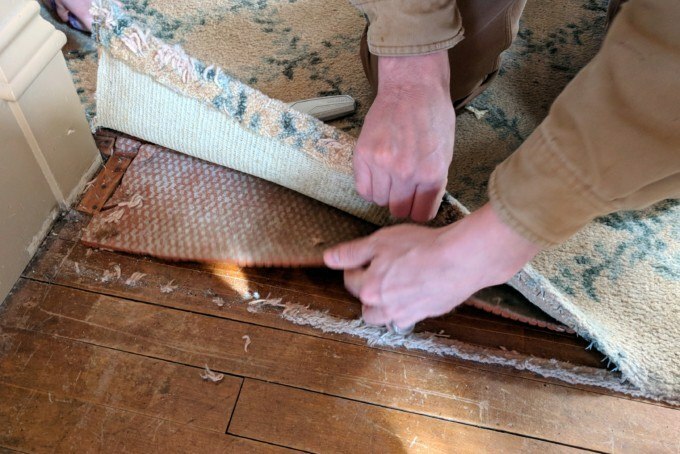 We found that the best method was to start out by slicing the carpet down the middle of the tread lengthwise with your carpet knife.. You don’t want to go all the way through the carpet and scratch the wood beneath, so be sure to hold one side of the carpet up with your hand while you cut. 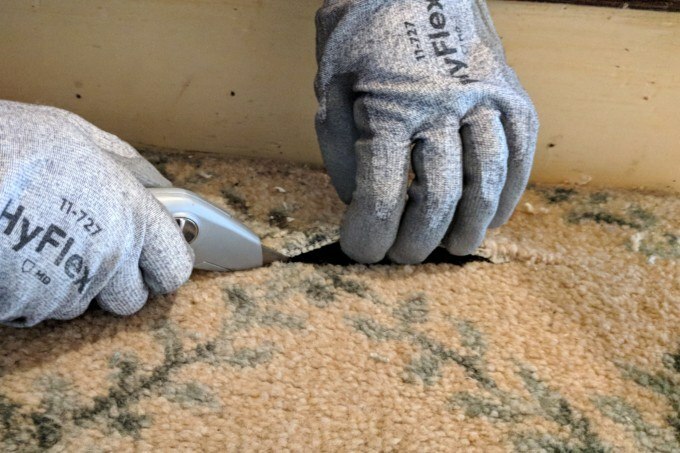 After you’ve sliced your carpet from end to end, use your tack lifter (basically a tiny pry bar) to pull up an edge. 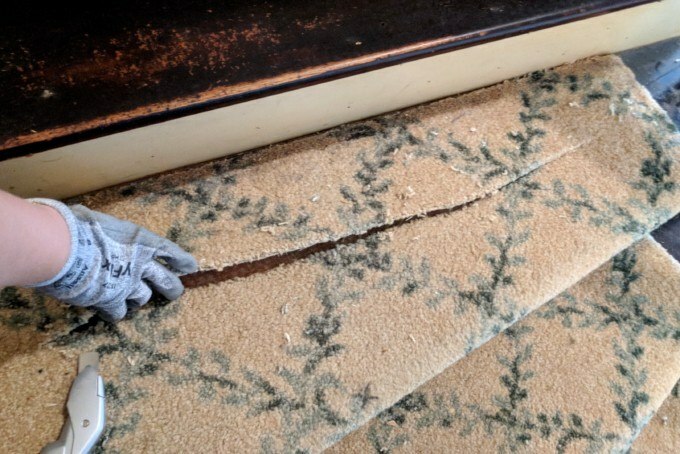 You may need to use your carpet knife again after the corner is pulled up so you can pull that whole strip of carpet up. 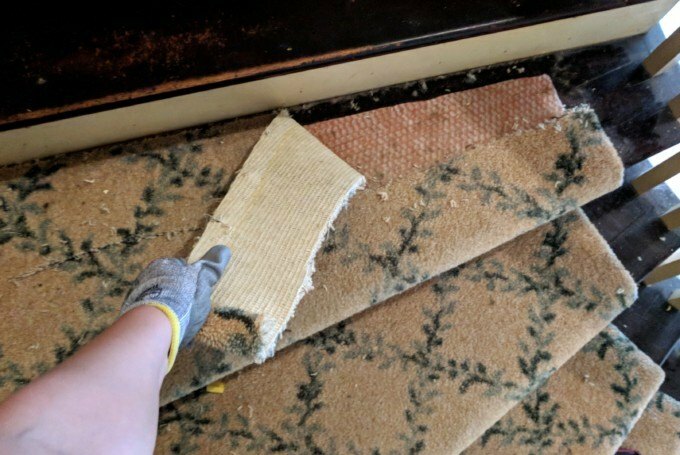 Once you’ve got that first strip of carpet pulled back, it’s so easy to pull back the rest of it! At this point, the carpet pad is just laying there and can just be lifted off! Now, all that you have left is pulling out a meeeeellion staples. Just kidding, it actually wasn’t that many per stair. 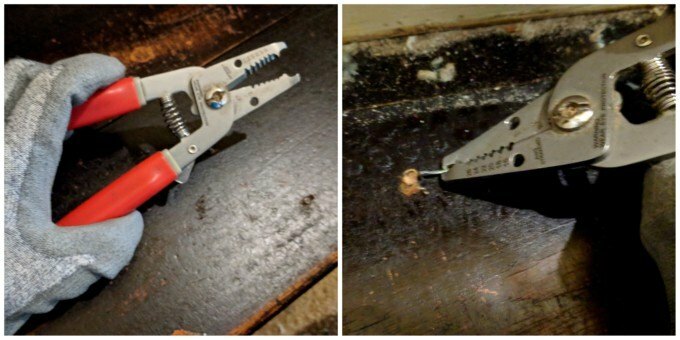 In addition to using the obvious pliers, we loved using wire strippers because they hook around that staple like nobody’s business! Put on a podcast or blast Pandora, and pull those suckers out one by one! We had 20 stairs in all, and we worked on it here and there until it was done. So it’s hard to give you an actual timeframe of how much time we spent on this. But I would guess it took about 20 minutes per step. You do the math. Hehe! We’ve begun painting (well, technically PRIMING) the entryway, and it looks AMAZING. But we only went so far up the stairs. 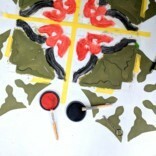 That’s another project for another day. I’m still trying to decide if I want a simple runner on these stairs to help with the LOUD echo-y factor of this large entryway. I’m just really loving it without a runner though, so the jury’s still out. Do you have an opinion? Leave me a comment! UPDATE! 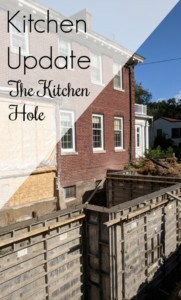 Below are links to posts that we’ve published about our ‘new’ house and it’s progress! Room Design for the Girls’ Bedroom! Thank you for this great post! I have been dreaming of renovating our stairs. 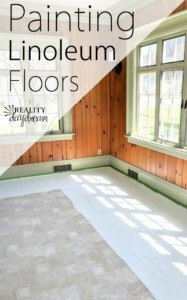 I would like to replace our old carpet with some beautiful vinyl flooring. This is why it was nice to read about your experience! Good to know about the slicing method you found. Now I just need to get all the right tools, and then we can start working! Thank you for sharing your tips! 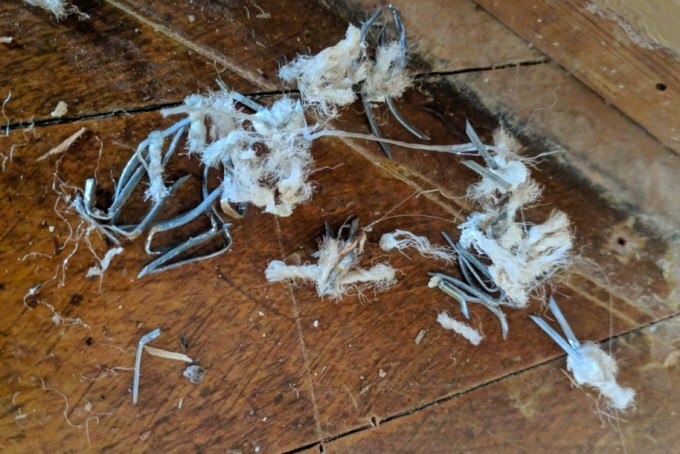 I am sure anyone with upcoming carpet removing project will find them useful! It’s a tie for me, between #1 and #6. I love the contrast of the wood against the white. i love #2 because it fits what I see you already doing in the house. 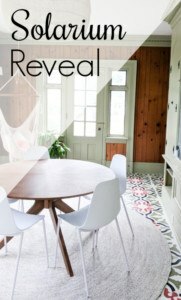 I love the raw wood look… but #1 screams “take pictures of me” as your daughters descend in prom or wedding dresses!! We have a very steep wood staircase in our 125+ year old home. We’re in a flood zone, and my mother is in her 70s, so carpet is out of the question. Also, we have pets, and I swore a house or two ago that I would NEVER again have carpeted stairs and pets at the same time. 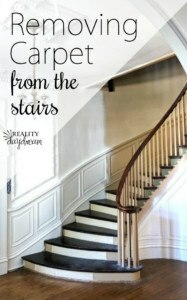 It’s just too hard to keep carpet on stairs clean, especially with stair rods, although they are beautiful. We just bought clear adhesive-back safety strips with a gritty texture; they’re made for stairs. It’s a compromise, but they are safe and slippage-free. Our staircase is dimly lit (another project), so the strips are hard to see. I love the bright white, but I need some color in my life! 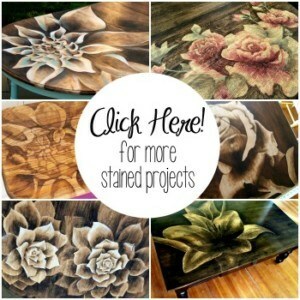 What about stenciling the front of the stairs or even using some of your staining techniques? I think that would look beautiful. 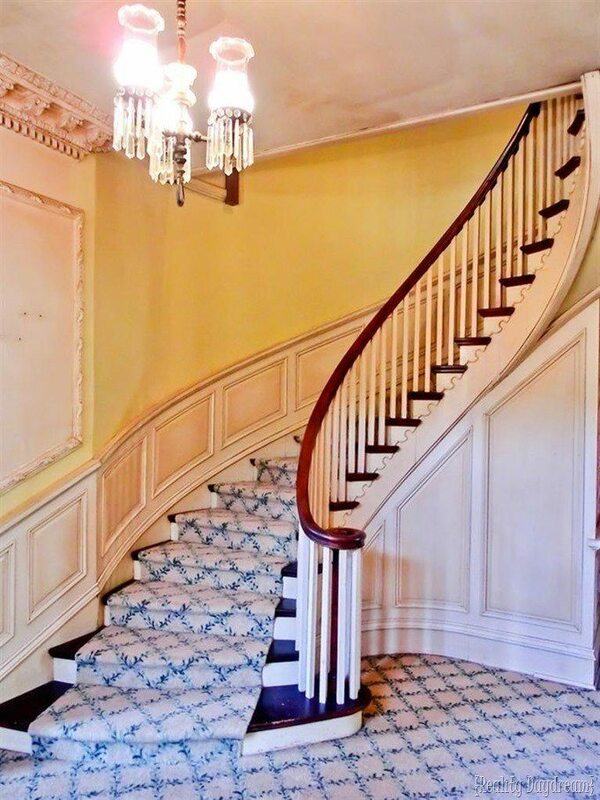 Fabulous I just love your house I vote for stair treads wishing you much Happiness . So beautiful already!! 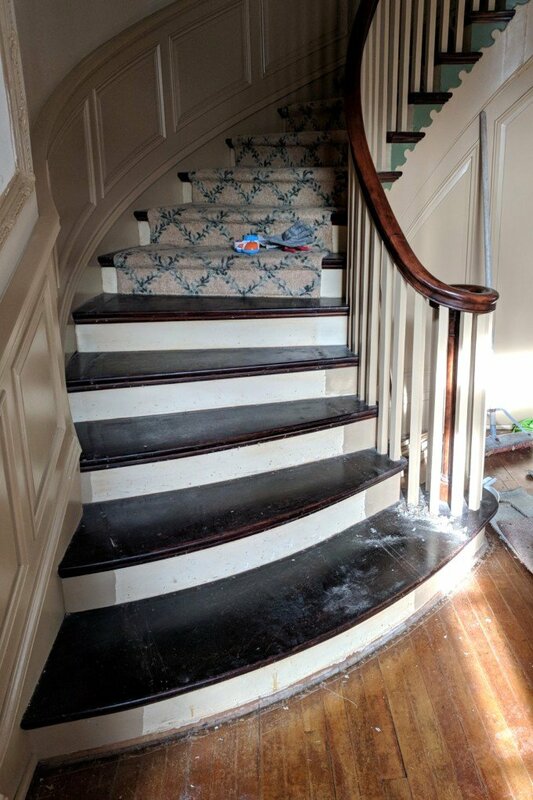 It’s hard to imagine a carpet runner breaking up the contrast of those gorgeous stairs, but if you added stair rods that similarly contrast the carpet color you may be able to get the best of both worlds- safety and beauty! Wow, what a big improvement already without the carpet. 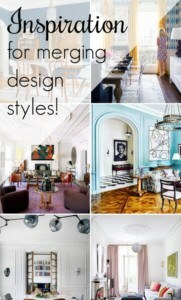 As for the possible decisions I like #1 for the stairs and walls, #6 for the table and # 8 for the lighting. I have had stairs with carpet and without carpet. Far and away, I prefer NO carpet for the simple reason that it is so much easier to clean. Carpet seems to invariably require getting on your hands and knees with a vacuum to really get it clean. All wood…..just a swiffer will do the trick! Can you do carpet stair treads, maybe in a color close to the wood color, instead of a whole runner? Would help with the slipping, but not cover so much of the wood. We have 13 wood steps but I haven’t gotten around to buying treads. That’s something I hadn’t thought of! Do they move around? Or do you staple them into place just link carpet? I need to do more research obviously. 😉 Thank you for this suggestion! I was thinking stair treads, too! I like Beth’s idea of having them dark to match the wood. Those gorgeous curves are too pretty to hide under a runner. While #5 is beautiful, let’s be real…cream carpet and 3 kids don’t work! I love the white walls, ceiling and risers with the dark steps and handrails. 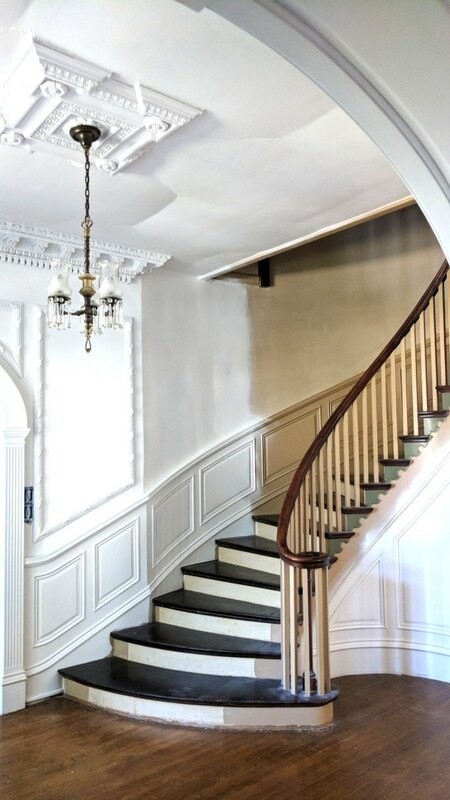 The white makes the space seem all the more grand, while the dark steps and handrails add crispness by their contrast. That is beautiful! I love #1 but that is totally impractical with three little girls running around and white carpet. It would stay clean a total of 2 seconds at my house! I can’t wait to see your house finished. It is going to be amazing. I have a great idea! 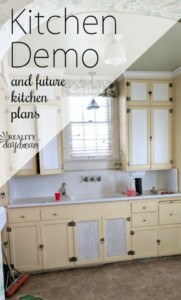 Why don’t you have an open house for all your readers. 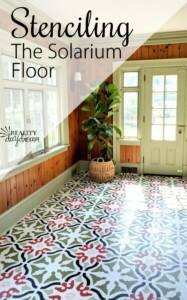 We would gladly pay a cover charge to view it and you could recoup some of your remodeling costs. What do you thin? I’ll brings some food along to share!!!!! Bahahaha Renee! I halfway like that idea, but Nick wouldn’t go for it for privacy reasons. 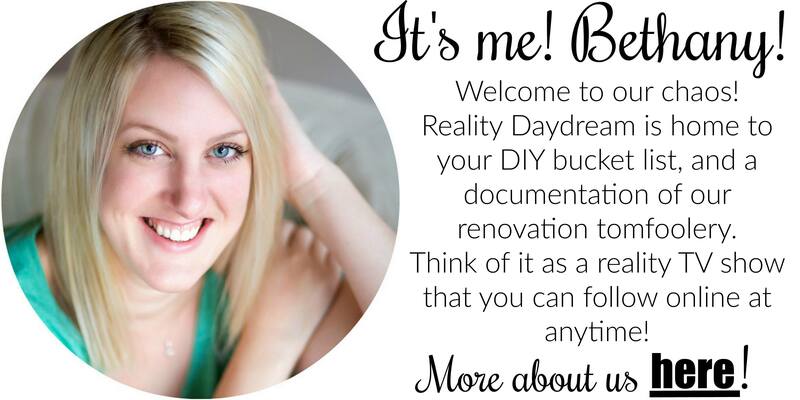 I am loving seeing this house take shape for you. My vote is no carpet runner on the steps :). I think once you get some things on the walls and furniture in the entry, it will cut down on the echo. I’m leaning this way I think. It just looks so pretty without a runner! 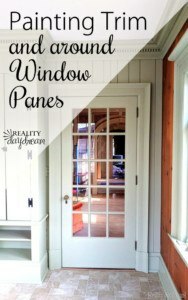 Although there are a lot of gorgeous options out there. And I hadn’t thought about how getting furniture and things on the wall will help with the echo. Good thought! I love this post. I am going thru the exact same situation. 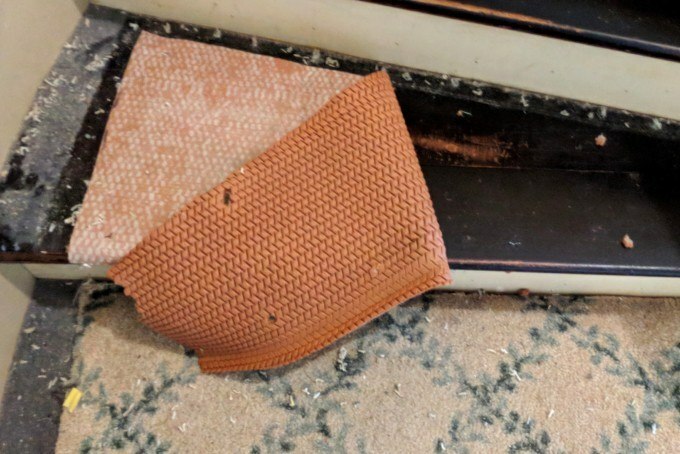 My fiance and I just purchased a 100 yr old Colonial and it is covered in carpeting. 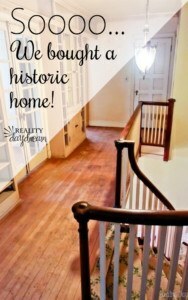 However, it has preserved the original hardwood flooring. Score! I love following your new home adventure! 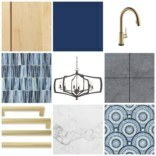 I love the wood color in #8, but my favorite has to be #1. It’s so fancy, I can just see Alicia Silverstone walking down those steps in her plaid pleated skirt. Loving the progress! 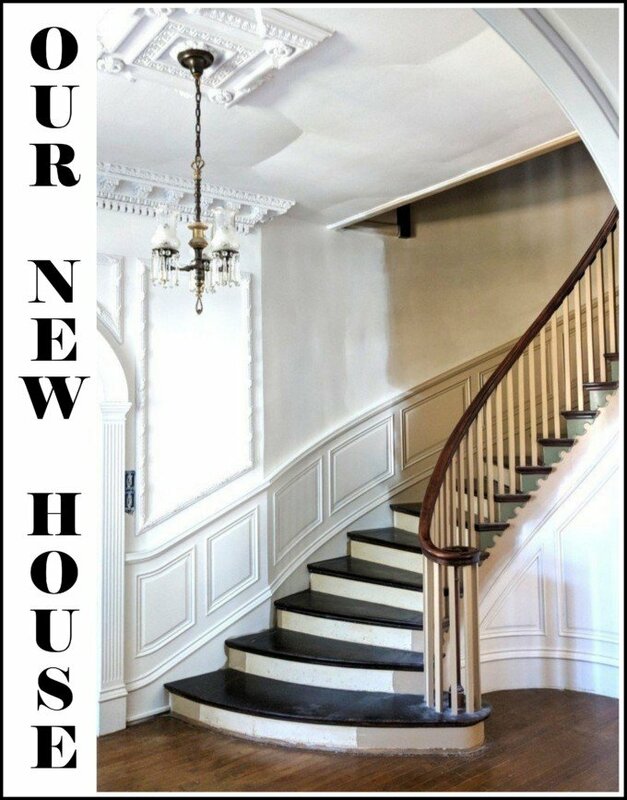 And I love that initial picture because despite the initial paint and carpet, that stairway SCREAMS potential, and you just KNOW it’s going to look good in the end!! I’m a person that has a talent for falling down stairs, so smooth/wooden stairs would be the death of me, so I would need to do a white runner down them, but I do love the look of the pure wood stairs! BAHAHAHA! This is a good point. One of my girls is super clumsy, and I can see her wearing socks and wiping out allllll the way down the stairs from time to time. Something to definitely consider! Have you see the stairs that have wallpaper on the risers? That would be so pretty there!! What an amazing transformation! If I were you, I would keep the dark and white stairs and continue with the white wall painting. The way you are doing it looks perfect! fresh, while still conserves the original design. Knowing you over the years, you will add a splash of fun colors (accessories?) to jazz things up.